This book is written for the beginning student of communication disorders with a basic understanding of phonetics, or the practising speech-language therapist whose phonetic training may need updating. It introduces the reader to the main areas of phonetics, and the main methods through which the phonetician reduces speech data to a permanent record. The book, then, illustrates the three main approaches to the investigation of spoken language; articulatory, acoustic, and auditory. Further, it describes how impressionistic phonetic transcription through symbolisation differs from instrumental phonetic techniques. For each of these areas of discussion, chapters are provided that examine the general phonetic aspects, followed by chapters that illustrate their application to clinical data. The authors are both phoneticians with experience of investigating both normal and disordered speech through both impressionistic and instrumental means, and this is the first book in this market that describes a whole range of data reduction techniques and illustrates them with data relevant to the student and practitioner of communication disorders. Martin J. Ball is Hawthorne-BoRSF Endowed Professor and Director of the Hawthorne Center for Research in Communicative Disorders at the University of Louisiana at Lafayette. His books include Clinical Sociolinguistics (Wiley-Blackwell, 2005), and Phonetics for Communication Disorders and Critical Concepts in Clinical Linguistics. 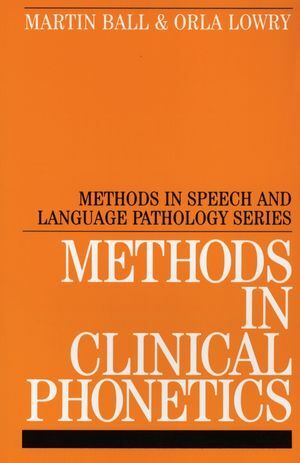 Orla Lowry is the author of Methods in Clinical Phonetics, published by Wiley. Articulatory Analysis of Disordered Speech. Acoustic Analysis of Disordered Speech. Auditory and Perceptual Analysis of Disordered Speech.